A few months ago my husband and I went to Europe and I realized I had no pictures of our trip in our house. I spent so much time taking pictures of everywhere we went I thought it was a shame those pictures were just sitting in a folder on my computer. I saw these mounted photos from Tiny Prints and thought that would be a perfect way to display some of my favorite prints-and I had an old pallet in the garage my husband was begging me to get rid of, so I decided to use the pallet wood to make frames for my new mounted prints. I love using pallet wood because it's free (you can usually find them in the trash at big stores or factories) and because it adds a rustic look that is so popular right now. 1. The first thing I did was soak the metal brackets in vinegar. Because I was using old rustic wood, I needed the brackets to match the old rustic feel. So I put the brackets and screws in a white vinegar bath. Leave them in there for several hours or overnight. I left mine in for about 24 hours. You won't see the rust/oxidation happen until they are removed from the vinegar and dry. The longer you leave them in the vinegar, the more rusty they become. 2. I then had my kind husband break off the pallet boards from the pallet frame and cut them to match my 12 x 12 mounted photos. 3. After the wood was cut, I washed it with a scrub brush and when they dried, I sanded them down and sprayed them with some polyurethane. 4. To assemble them I glued the seam and then attached the corner brackets. 5. To attached the mounted photo, I just used some industrial tape to tape the back of the mounted photo to the frame. You can also attach a picture frame hook to the wooden frame if you plan to hang it on the wall. 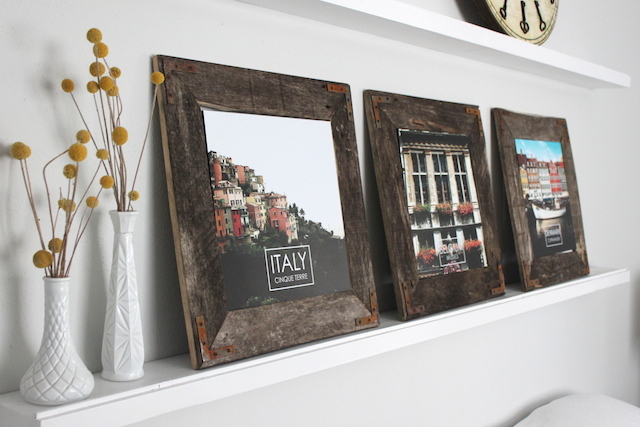 They're such a conversation piece because of the rustic wood and such a fun reminder of our trip.